With Spring finally settling in, minus the odd shower or two i’ve found myself opting for the same makeup look as it’s simple, quick enough to do in the mornings and also perfect for Spring. 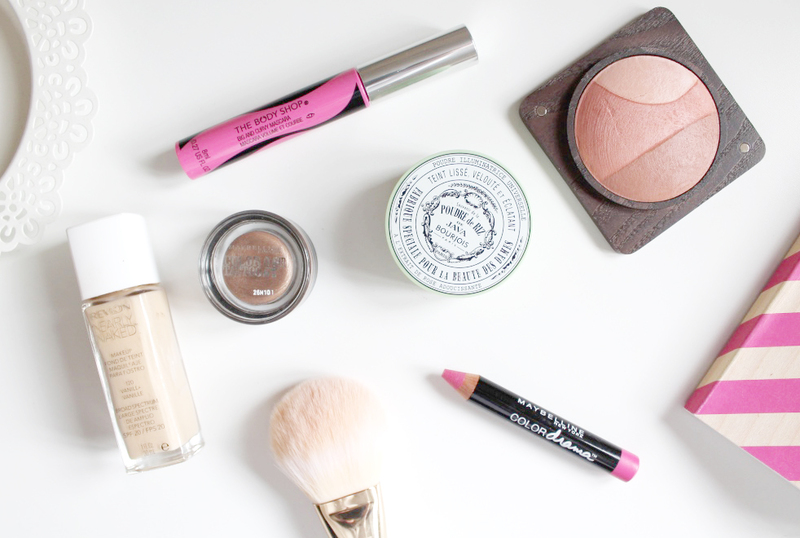 I thought today i’d share what products i’ve been turning to recently and it may give you some ideas on how you can also find your own fail safe spring look. When it comes to Spring makeup my motto is ‘less is more’ as I always find myself opting for the minimalist of products in order to create my everyday look and I always stick to the same, never switching it up all that much and for someone who isn’t great with routines it is a bit of a shock. I mentioned in a few posts back that i’ve been pulling out my more warmer weather appropriate foundations and one I can always count on is Revlon Nearly Naked Foundation (£8.99). It’s perfect for the warmer weather as it gives great coverage without that cakey, layered feeling to the skin and is always one I can count on. Sticking with base products and diring the warm months I like to give my skin a little big of a glow and as my skin is naturally quite dull the Bourjois Java Rice Powder (£9.99) allows me to fake that ‘summer glow’, whilst also setting my foundation for the day. Cheeks now and I could have picked so many products but i’m loving the Kiko Tri-Bal Soul Baked Blush* (£14.90) at the moment. This baked goodness is a bronzer, blush and highlight all in one that just gives my cheeks that glow and pop of colour that it cries out for and the highlighter is the prettiest shade ever for pale girls like me. Onto the eyes and if you’re as lazy as me then you will also love the Maybelline Colour Tattoo (£4.99). I use the shade ‘On and On Bronze’ all the time to give my eyes a sweep of colour and I really want to get a few more shades as they make eye looks so much easier to achieve and almost effortless. Mascara is one that I probably switch up the most but The Body Shop Big and Curvy Msacara (£10) is so good for giving your lashes a good curl and lift in literally seconds. The brush coats the lashes so quickly but without making them clumpy and I just love this mascara – need I say more? Lastly is the lips and i’m not into the ‘Kylie Jenner lip’ but I have been loving summery pink shades a lot more recently. The Maybelline Color Drama Velvet Lip Pencil (£4.99) in the shade ‘Fuchsia Desire’ is my most recent addition and i’m obsessed. They’ve brought out some new shades recently and if you haven’t seen them for yourself then you need to! What are your fail safe Spring products? Make sure you’ve entered my Giveaway with Iconemesis to win an iPhone case of your choice! Enter here.